The Unknown Official can be found in Iceland’s capital, Reykjavik. 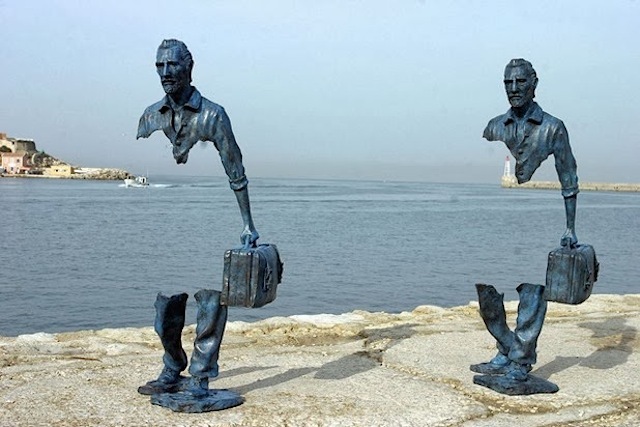 Created by Magnus Tomasson in 1994, the sculpture depicts a man in a suit, walking with a briefcase in his right hand, his upper torso encased in un-sculpted rock. The Kelpies are two gigantic, 30 metre high horse heads, created by Scottish artist Andy Scott in 2013 from over 500,000 kilograms of structural steel. The sculpture is based on a Celtic myth, though it also symbolises and celebrates the contribution of horses to industry and agriculture. At the port of Marseille in the south of France, there can be found a surreal series of bronze sculptures by French artist Bruno Catalano called ‘Les Voyageurs’, which translates as ‘The Travellers’. Of the travellers, there are ten; they are all life-size and depict civilians going about their day-to-day lives with large chunks of them missing. Polish artist Jerry Kalina created these sculptures in 2005, to be placed just outside of Wroclaw’s city centre. The piece depicts 14 different people on their way to work, and is a memorial of sorts for those who were lost or affected after the imposition of martial law in Poland in 1981. During that time, the military would arrest innocent people, many of whom were never seen again, in the middle of the night, on very little to no grounds. This offering from Czech artist David Cerny depicts the all-too-well known psychoanalyst Sigmund Freud hanging by one hand from a roof in Prague’s city centre. Created in 1997, the sculpture has certainly done the rounds since it’s completion, from Stockholm to Chicago to Michigan and back to Prague. Wherever it goes, you can be sure it gives people a good old shock to the system when it catches them off-guard.